Medela Harmony Manual Breastpump,Medela Harmony Manual Breastpump for occasional pumping. Medela Harmony Manual Breastpump for occasional pumping. Medela Harmony is a manual breastpump for occasional pumping. It is the best selling manual breastpump. 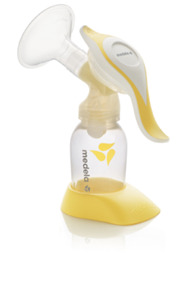 The Medela Breastpump works on 2 phase expression technology which is based on 2 phases of how babies breatfeed. First is the stimulation phase to stimulate the milk flow. Second is the expression phase where the let down starts allowing the milk to flow faster. Works on a 2 phase expression technology. Soft touch swivel handle for better comfort. 24 mm personalfit breastshield. Other sizes are also available separately. Comes with a bottle stand that prevents spillage.